Update: We have recently also published the top mens running trainers under £100 – find it here. It’s hard to understate the importance of a decent pair of trainers when it comes to road running. Pounding the streets for miles on end with inadequate footwear is a recipe for disaster. Your feet will suffer yes, but your joints will suffer too. The impact of hitting the ground with force repeatedly can cause strain and damage to knees and hips if the trainers aren’t adequately cushioned to soften the blows. Having said that, perhaps you are just getting into running – maybe you’ve registered for your first 5 or 10k, or maybe you’re a more casual runner – you’re going to be battling through a half marathon and it’s not necessarily about the time you register – more the accomplishment of finishing the race. Either way, it’s unlikely you are going to want to break the bank on a pair of road running trainers. If you wanted to you could easily end up spending north of £250 on a pair. But for this review, we’ve focused purely on the midrange price point of £100. We’ve also exclusively focused on road running footwear – that means that trail or track running shoes are out. We’ve picked out 5 of our favourite women’s road running trainers below. Any of these would make for an excellent choice of shoe. If you want more info on what to look for in your road running footwear you can read this at the bottom of the page – otherwise, let’s jump right in. 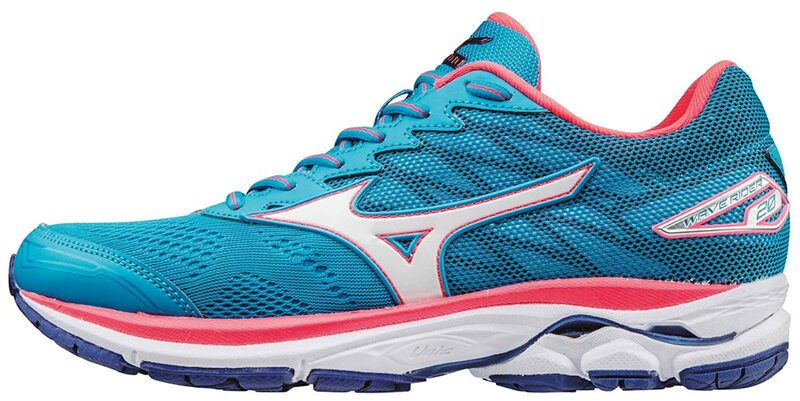 We found these Mizuno trainers to be super-breathable and extremely comfy throughout the test run. Mizuno will tell you it’s as a result of their ‘Air Mesh’ technology, while also boasting of ‘Dynamotion Fit’. Frankly, many of these terms feel like marketing gumph, and while I don’t doubt there is great technology and research that goes into the making of running shoes, the terminology is meaningless to the lay-woman. But what I do know is these trainers felt well supported and cushioned, particularly in the heel thanks to a chunky wedge. Rough price point is £70 – £80 and as well as the turquoise shown here, these also come in red with purple detailing. These Adidas trainers make for an excellent purchase for running shorter distances. They also look great, so can happily double up as a casual shoe. 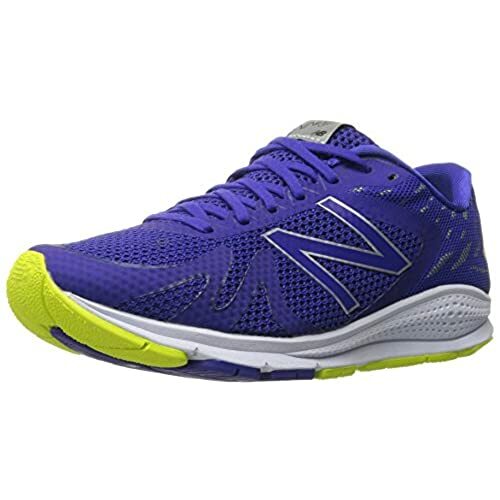 These are one of the cheaper pairs of running shoes we’ve selected at around the £50 mark. But for your money you get an extremely stylish shoe in classic black with neon-pink detailing that is absolutely ideal for shorter runs, and would also make for great walking trainers. The cushioning on these isn’t as good as on some of the slightly pricier ranges, so if you are going to be running half marathon distances or further then you may wish to look elsewhere, but for 5k or 10k distances these are ideal. We’d recommend getting a size up, as many users have reported their usual size is a tad too snug. 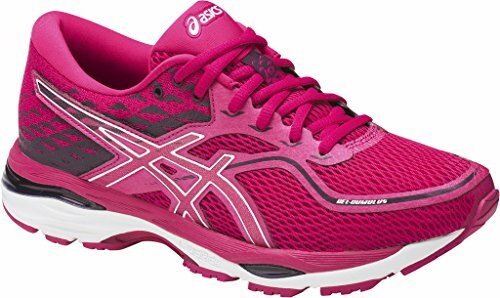 Asics are a renowned brand in running shoes and these gel cushioned trainers offer excellent support, so perfect for longer runs. As the name implies, these trainers feature the Asics Rearfoot and Forefoot GEL® Cushioning System. In reality, this means that you are getting great levels of cushioning with these trainers – and not just in the heel as many shoes tend to focus their cushioning. If your running style means you are on your toes a fair bit then these may be a great choice. Personally, I’m not a great fan of the shocking pink colour featured here, but fortunately these come in a choice of around 14 different colour combinations so you’re certain to find a style you like. As with the Adidas shoes above, we’d recommend you order half a size or a full size up from your usual fit. Rapid rebound cushioning and performance stretch laces from an extremely reputable brand. These can be picked up at an astonishingly reasonable price too. Vazee Urge is a stupid name – but New Balance has a tremendous reputation in running trainers and these shoes live up to that. They have an RRP of £70, but can be found for under £40 – which is frankly ridiculous. They feature ‘Performance Stretch Laces’ which actually seem to make a difference, ensuring that the top of the foot isn’t constrained and ‘choked’ on take-off. We have read a few reports from users suggesting that these wore out quite quickly, so if you are hitting the road several times a week and longevity is something you are concerned about, you way want to look elsewhere. I’ll be perfectly honest – I think these look like a dog’s dinner, and they aren’t cheap either at just a shade under our £100 budget. But if looks aren’t a primary concern for you (or if you like the way they look of course) then these are a great running trainer. Brooks is another well-respected running brand. 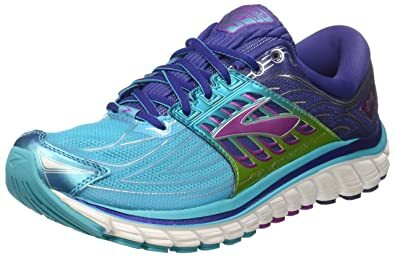 These trainers feature glycerin cushioning which is almost certainly what you are paying the extra for, but you are rewarded with a super-comfy run. Indeed I would say these are the comfiest of the shoes we trialled. As long as you are looking specifically at running shoes (as opposed to just trainers for instance) then you are in a good starting place. If you are next looking at trainers specific to the running discipline you are likely to take up (road vs trail vs track for instance – the article on this page specifically looks at road running trainers, meaning these wouldn’t be suitable to trail or track running) then you are 90% of the way. The final 10% is where it gets a little tricky. Ideally, you want to select a running shoe based on your running style or your ‘pronation’. Everyone’s feet are different and the way in which everybody runs is different. The way in which your foot strikes the floor and moves and flexes through to take off is known as your pronation. 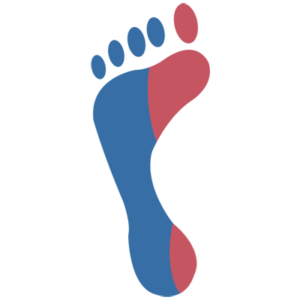 There are basically three types of pronation – under, over and neutral. Each of these is best explained with a diagram. These are exaggerated to make it a little easier to visualise. The outside of the heel and foot takes the brunt of your weight. Liitle impact on the big toe. You land on the inside of your heel and the big toe and inside of the foot is used for take off. You land on the centre of your heel and take off on the ball of your foot and all toes. In normal day to day life you are unlikely to notice this, but when you run for several miles, with the repetitive force of your foot striking the ground, your pronation can cause you problems if the area of your foot that is doing all of the work and taking all of the impact isn’t sufficiently cushioned. So how do you know what your pronation is? Undeniably the best way is to visit a specialised running store which has a gait analysis machine. This is essentially a treadmill with a slow motion camera attached. You hop on to the treadmill, run for a minute or so and then the operator will review the video in slow motion and prescribe your running style for you. Another option would be to examine your current running shoes or other trainers that you have used for a while. You will notice a wear pattern on the soles of the footwear that you can then compare to the diagrams above. If the wear is worse on the outside of the shoe then you are likely an under-pronator. If the wear is on the inside, then you are likely an over-pronator. If the wear seems even then chances are you have a neutral gait. This article has focused on a general view of the best running shoes without really taking into consideration pronation – we will be following up in the future with a selection of the best shoes for each of the pronations described above.